When you need to decide on the size of the LED display for your business, there are several factors that should guide your decision. Take a look at these three guiding factors to help you make a wise decision when it comes to choosing your LED display size. Choosing the proper LED display size depends on your application. 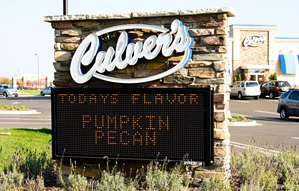 If you have a sign that is high and set far from a high traffic road or highway, you would want to consider a larger LED display. It’s critical to make sure your display is legible from far distances. If your application is closer to the road and set at eye level, you can get away with a smaller display. You also have to consider how you want to utilize your display. If you’re considering a monochrome or signal color unit, you will most likely be displaying text to your potential customers. If this is the case, you will want to make sure your display is larger in size to allow the appropriate amount of lines of text to send messages to your customers. If a full color display is an option, you will want to make sure your display is antiquating to your application. Full color displays give you more of an eye-grabbing and memorable message. You will want to make sure your display is big enough to send full color graphics, animations, and potential videos. With full color displays, the bigger the better if it fits in your budget. You have to think: ultimately, this is a mini billboard for your company, and you want to make sure your display is big enough to get your graphics to your potential customers. If full color is an option, a good size to start with would be a 3’ x 6’ display. This is a template to start from and will allow your customers to grab your messages if your application is more eye level and closer to the road. Of course, you will want to consider a bigger size if your application is set higher and further from a high traffic road or highway. Have questions about the right LED display size for your business? Get in touch, we're happy to help!